PORTLAND – Muslims from throughout Greater Portland gathered at the Portland Expo on Friday to celebrate Eid al Fitr, one of the holiest festivals in Islam, marking the end of the monthlong Ramadan fast. Sumaya Mohamed had intricate patterns of henna applied to her hands for the Eid al Fitr celebration at the Expo. The event was organized by the Islamic Society of Portland. Photos by Gregory Rec/Staff Photographer Women gather for prayers Friday at the Portland Expo to celebrate Eid al Fitr and the end of the Ramadan fast. “One of the rationales for (fasting) is, you feel the hunger and think, ‘What about those people who have nothing to eat?’” said Abdullahi Ahmed, president of the Islamic Society of Portland. 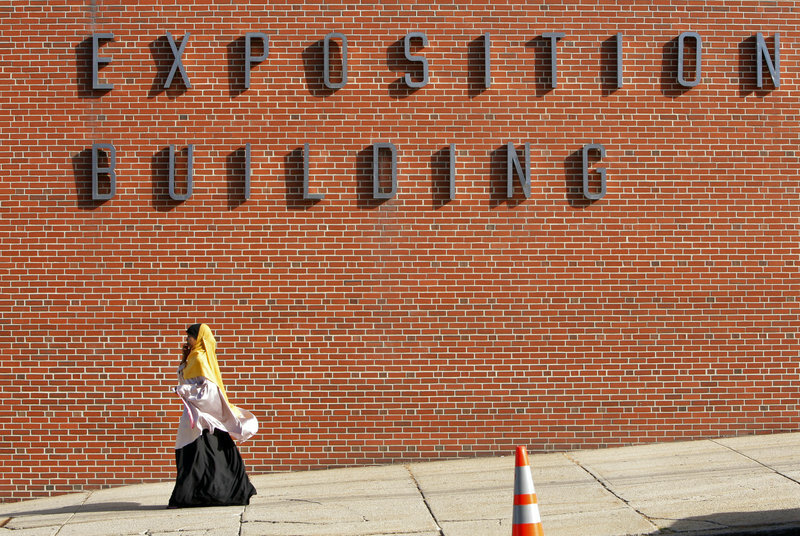 A woman walks by the Portland Expo, where local Muslims celebrated Eid al Fitr. As Maine’s Muslim population has increased, small gatherings have given way to a larger celebration. They arranged themselves on the Expo’s hardwood floor in long rows, men on one side of the large hall and women on the other, many wearing their best clothes. Meanwhile, men took turns at the front of the room chanting verses expressing their devotion. They also urged those gathered to dig deep in their wallets for “zakat” — charity — to help people who are less fortunate, a central tenet of Eid al Fitr. Fasting and charity are two of the five pillars of Islam. “One of the rationales for (fasting) is, you feel the hunger and think, ‘What about those people who have nothing to eat?”‘ said Abdullahi Ahmed, president of the Islamic Society of Portland. Ahmed, a science teacher at Deering High School who lives in Westbrook, came dressed in a business suit and a paisley tie. He is working on his doctorate at the University of Maine. He and his wife, a nurse, have four children. He said that as an American Muslim, he has a sense of belonging that eclipses the hostility of the Rev. Terry Jones, the pastor in Florida who threatened to burn copies of the Quran, Islam’s holy book, to mark the anniversary of the Sept. 11 attacks. The support of national leaders and assurance from the community have been important, Ahmed said, but there is still work to be done to reach a mutual understanding and acceptance. As worshippers hurried to their places Friday, the prayers got under way, everyone kneeling in the direction of Mecca, the spiritual home of Islam. Almost everyone in the hall bowed in unison, expressing humility and devotion, as the imam intoned the prayers. Children not old enough to appreciate the significance of the event scampered through the building while toddlers cried for attention. The religious observance is oriented toward adults, said Keyf Ahmed, who brought along his son and daughter. The time for children comes afterward. Friday’s events included a soccer game for youths at Fitzpatrick Stadium just after lunch. Eid al Fitr is an occasion to forgive grievances with others and to ask forgiveness from God, said Abdullahi Ahmed. It draws people from all walks of life. 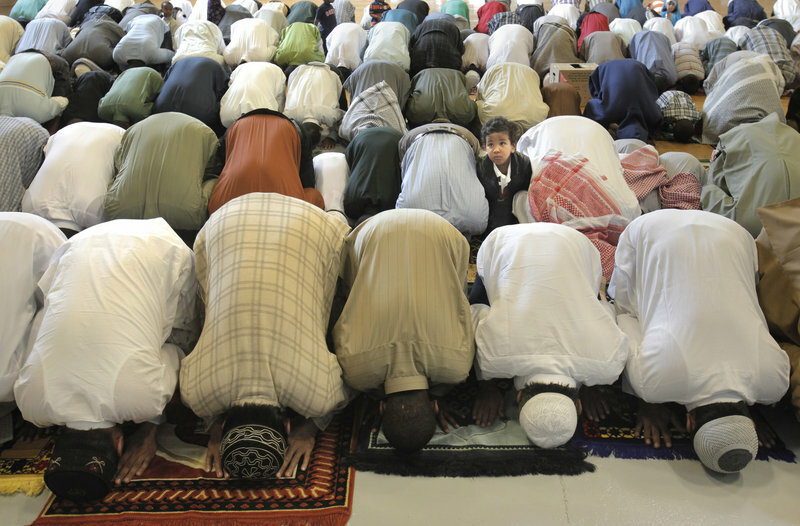 On Friday, men in elaborate ethnic dress knelt alongside teenagers wearing polo shirts and jeans. 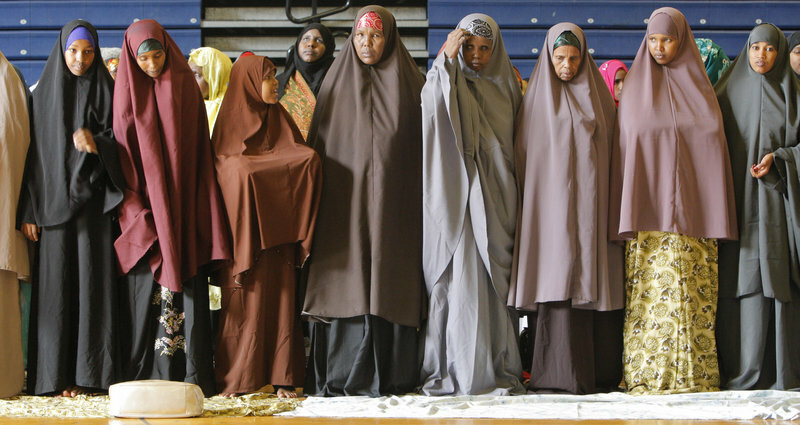 The money will be used to help members of the Muslim community here who are struggling, or it will be sent overseas, where many people are less fortunate, said Mohamud Barre, director of the Somali Cultural and Development Association of Maine. Eid al Fitr is a time to thank God for all his blessings, said Ayesha Baye, who is from Ethiopia. “We’re thanking Allah — God — for giving us health, shelter and meeting all the needs we have,” she said. Baye and her daughter Hayat stayed up late Thursday night dyeing intricate designs on their hands with henna for the occasion, and she readied the house for guests who would come for lunch. Friday’s event was organized by the Islamic Society of Portland, a group that is heavily influenced by the city’s large Somali population. But the gathering was immensely diverse. An older gentleman from Burundi, wearing a splendid brown suit and a yellow kufi cap, warmly greeted a young Somali man wearing an immaculate white kameese, or tunic. Rahmatullah Habibzai spent four years fighting to drive the Soviet Union out of his native Afghanistan before coming to America, where he now works for a trucking company. “We’re all Muslim. It doesn’t matter which country you’re from, we perform the prayer of Eid,” he said. When he arrived here 23 years ago, Habibzai said, families would gather in small groups to celebrate Eid al Fitr because there were so few Muslims in Maine. Now, there are enough to enjoy a large celebration together. Portland may be the ideal size for that joining of cultures in observance of a shared faith. Amal Salem, originally from Saudi Arabia, is visiting from Tennessee, where she said the Muslim community is so large that it breaks into sects for separate Eid observances.